CASTING THE FIRST STONE focuses on six women who regularly confront each other from opposite sides of a police barricade. Three believe that abortion is an inalienable right. Three consider it murder. Shelley Miller, director of the Women's Suburban Clinic in Paoli, Pennsylvania, endures constant harassment from anti-abortion groups camped outside her doors. Joan Scalia, a Catholic mother of six, defies her husband to join Operation Rescue's efforts. Sharon Owens, clinic counselor and adoptive mother of three, is closer to the middle. She cannot decide when human life begins, but feels required—as a Christian—to serve others who must. 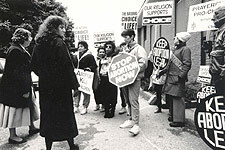 As it chronicles the daily lives of these and the other women, the camera records anti-abortion blockades, counseling sessions, a visit with a young mother the protesters persuaded to have her baby, and Planned Parenthood's emergency board meetings after the Supreme Court's historic Webster v. Missouri decision. Rare in giving equal voice to both sides, CASTING THE FIRST STONE is among the most insightful documents of the abortion struggle ever made. "A riveting, unblinking look at the realities of the abortion debate, giving us enormous insight into why American women are so deeply divided. "—Faye Ginsburg, New York University; author, "Contested Lives: The Abortion Debate in an American Community"